Join us at Chicago Glass Collective for a new Holiday class! 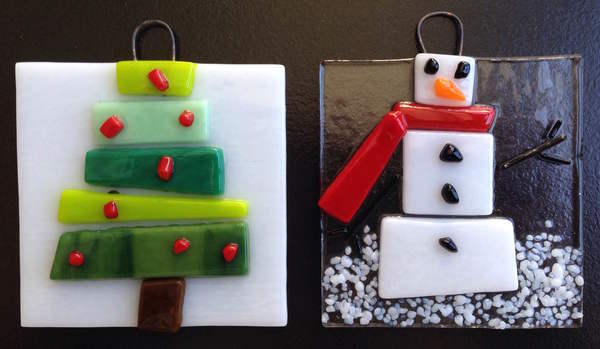 In this fun and family friendly 2-hour class you will create two 3" x 3" fused glass ornaments. Using a variety of colorful flat glass, holiday-themed ornaments will be safely designed and assembled. Cut special kiln paper to create beautiful snowflakes that will be encased in glass and fused in a kiln. Also, use small pieces of colorful flat glass to make snowmen, menorahs, Christmas trees, penguins, reindeers, dreidels and more! Pick up your fired glass pieces in one week. Additional ornaments can be made for $15ea. Great for ages 10+.